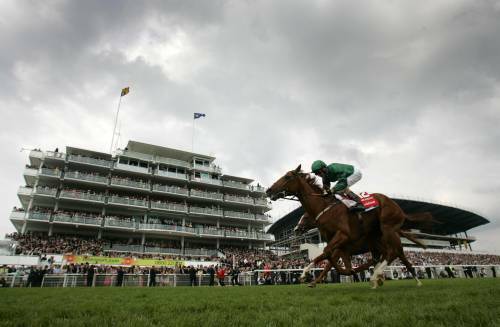 Epsom racecourse is famous all around the world because of the Derby which has been run there since 1780. The Oaks which is the fillies equivalent of the Derby is also run at Epsom normally the day before the Derby. The picture on the right shows New Approach winning the 2008 Derby. The Derby course is very up and down. The first half mile being uphill, then sweeping downhill around Tattenham Corner, continuing downhill until a furlong out where the ground rises again. The sprint courses are downhill and are the fastest in the world. The course overall is one of the sharpest in the country and needs a horse with gears. It is thought that the surface is very similar to polytrack and therefore form can be transferred between the all weather and Epsom. When the ground is soft it is a big advantage to be up against the stand side rail, and to do this you need to be leading coming round Tattenham Corner, therefore for this reason being a front runner is a big advantage when the ground is soft at Epsom.